This fight contains many titillating elements. Two big gladiators, one white and one black square off in the naked city. Separated by skin color and opportunity, as one man had a car and the other didn’t. Watch as the car owner (the white man, of course!) wields a machete at the poor black man holding a trash can. 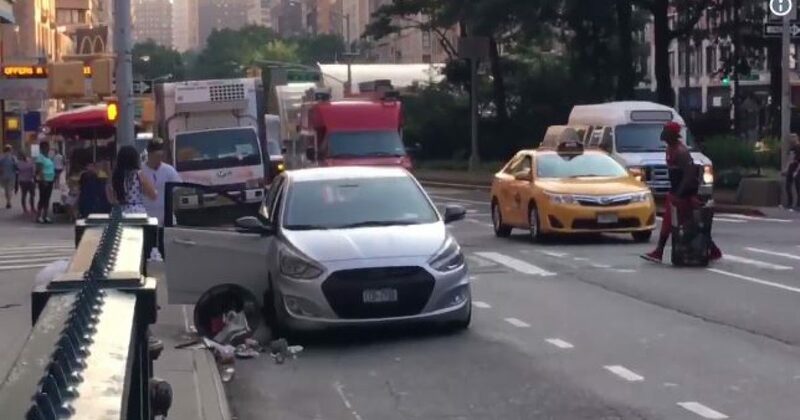 Police told the New York Post that the brawl took place on Broadway and West 94th Street in New York City’s Upper West Side. That’s right, New York. A man wielding a machete faced off against a guy armed with a garbage can on an Upper West Side street Wednesday morning — and their epic brawl was caught on camera. Let me ask you. In a fight, would you rather have a trash can or a machete? Unless the fight is over garbage cleanup, I’ll take the machete. Apparently, the fight started over nonsense. That’s what the driver Louis Roman, 40, did. He made a comment about the black dude not paying attention and threatened him by flashing a gun clip. First of all, why involve yourself in something that’s none of your business. And then secondly do the cowardly thing and flash a gun clip. I’m not sure why a pedestrian “armed” only with a trash can would throw the can at a man who might have a gun. But that’s what happened. Witness Paul Tena, who tweeted out footage of the fight, told the West Side Rag blog he turned on his camera when he saw the pedestrian respond by throwing a garbage can at Roman’s car — and the driver emerged with a machete and chased the trash thrower back to the median. The clip starts with the pedestrian dragging another garbage pail across the busy street as Roman waggles the blade on the sidewalk — while his female companion tries to put herself between the two. She seems to talk her blade-brandishing pal into getting back in their car, but when the trash man tries to get in too, the driver rushes out and hurls the machete at him. The garbage guy blocks the flying blade with the can, then returns fire with the pail. Both unarmed, the pair briefly engage in fisticuffs in the middle of the street before Roman once again tries to get back in his car — only for his foe to pick up a bottle that had spilled out of the trash and hurl it into the vehicle. Roman lobs his own piece of trash in return, then finally gets back in the vehicle for good. As you can see, neither man could actually fight. Though I give the brother the victory in the scuffle I saw on video. You can see blood on the shirt of Roman, likely from an earlier encounter between the two. But the sad part in this lies in the volatility of people. The idea that anybody would engage in such an altercation over nothing showcases how Left the world has become.